Big Lake Trees for Sale! 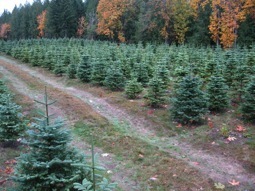 Bob and Polly Winkelman purchased the farm in 1973 and planted the first Christmas trees in 1974. They were looking for a place to retire and enjoy the land. Most people would not call farming retirement, but they both had a love of the land that makes it a joy to work with nature. Bob grew up on a farm in Nebraska during the Dust Bowl. Drought and old farming practices caused his family to lose their farm. Remembering this, he focused on working the land in a sustainable way. Polly always had a love of nature. In 1937 she applied to the University of Washington School of Forestry, but was told, "Forestry is not for girls." She became a teacher instead and developed the first elementary environmental education curriculum for the Issaquah Public Schools. The tree farm gave her an opportunity to be outside and work among the trees; the things she loved to do most. 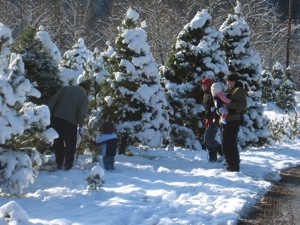 Ralph and Ruth Heft, the Winkelmans' son and daughter-in-law, bought adjoining land in 1974 and planted their first Christmas trees in 1979. They took care of the trees on vacations until Ralph retired in 1999. Ralph attended forestry school at the University of Montana, where the first woman graduated in his class of 1967. It appears Polly was born a generation too soon. Since Bob and Polly’s passing in 2006 Ralph and Ruth continued to work the farm with help from Ralph’s brothers Phil and Bill and the grand kids (Rebecca, Brandon, Colin, Erin, and Sean). After Ralph passed in 2010, Ruth, Phil and Terri, Bill and Cynthia have taken on the operation of the farm so that the family business will continue into the future. We hope you grow to love our family legacy, Big Lake Trees, as much as we do!